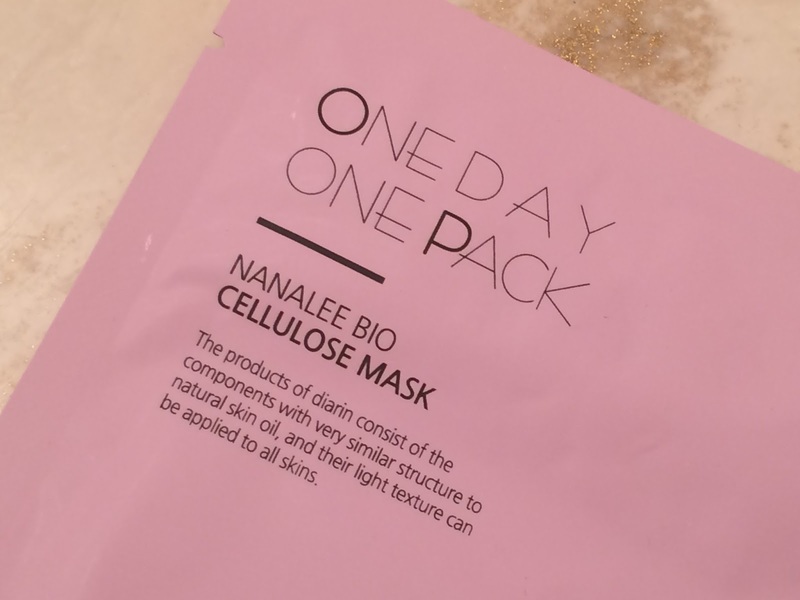 Several months ago I first received a Nana Lee One Day One Mask Pack from the lovely Hanna at Mochi Beaute and I fell in love. It's a mask that I've kept (like many others that Hanna has suggested to me) for use on special occasions or when I need an extra special pick-me-up. This happens to be one of the latter of those times, so an nice night of pampering and forgetting my troubles is in the works. Tonight I'll be sharing my thoughts with you about this mask. This mask is a thick opaque biocellulose gel-type mask made from coconut. 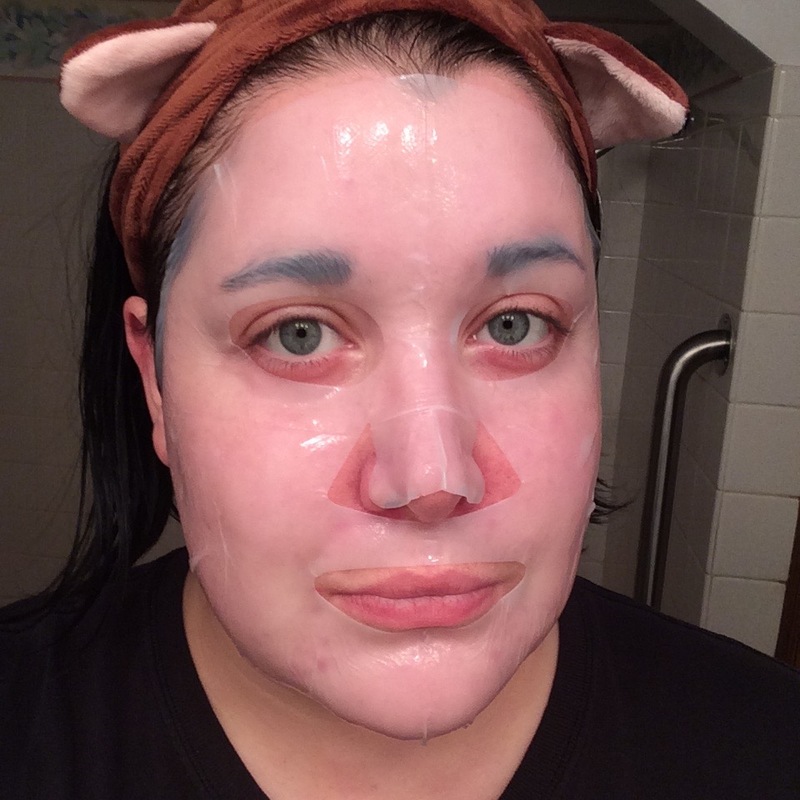 It's more sturdy than traditional hydrogel masks but in my opinion it sticks to itself more easily. This mask is made with cherry blossom, chamomile, ginseng, licorice, and cranberry extracts to hydrate the skin and give it a more even looking complexion. Prunus Serrulata Flower Extract, Water, Glycerin, Dipropylene Glycol, PEG/PPG-17/6 Copolymer, Niacinamide, Chamomilla Recutta (Matricaria) Flower Extract, Glycyrrhiza Glabra (Licorice) Root Extract, Cordyceps Sinensis Extract, Morus Alba Bark Extract, Butylene Glycol, Panax Ginseng Callus Culture Extract, Glyceryl Caprylate, Phenoxyethanol, Chlorphenesin, PEG-60 Hydrogenated Castor Oil, Xanthan Gum, Hydroxyethyl Acrylate/Sodium Acryloydimethyl Taurate Copolymer, Phenyl Trimethicone, Adenosine, 1,2-Hexanediol, Disodium EDTA, Perfume, Sodium Hyaluronate, Capryly Glycol, Vacconium Macrocarpon (Cranberry) Fruit Extract, Tropolone, Sodium Phosphate, Disodium Phosphate, RH-Oligopeptide-1. 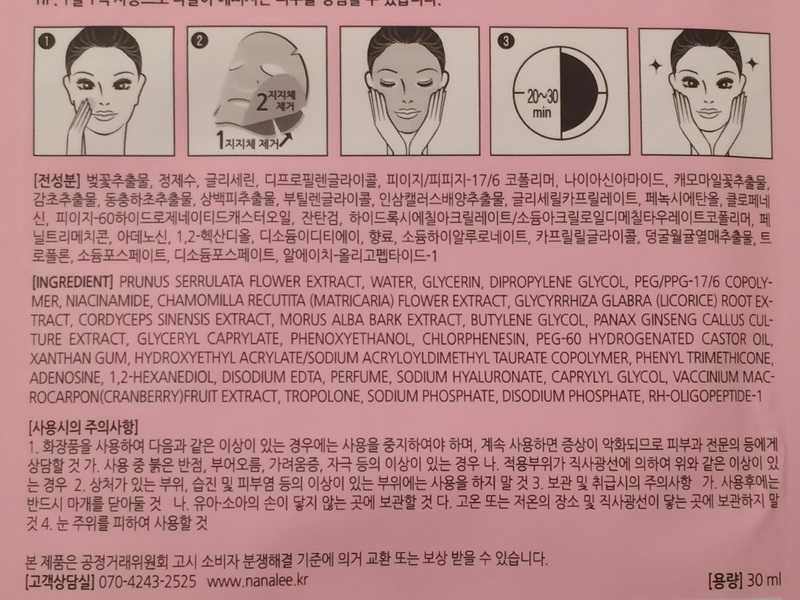 To get an idea of how this product might work for you, it may be helpful to know what my skin is like when reading my thoughts about the performance of this product. 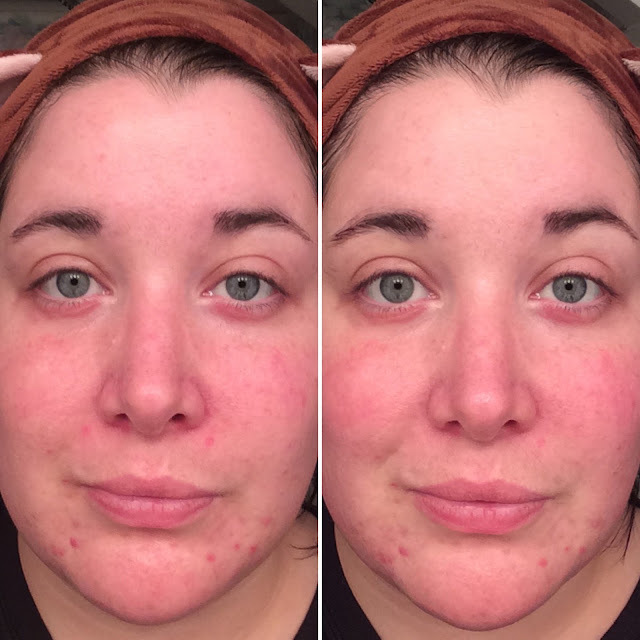 My skin is combination (normal/oily with a couple dry patches) and acne prone. I have minimal fine lines under my eyes, hyper-pigmentation from acne scarring and sun damage, and am sensitive to alcohol. 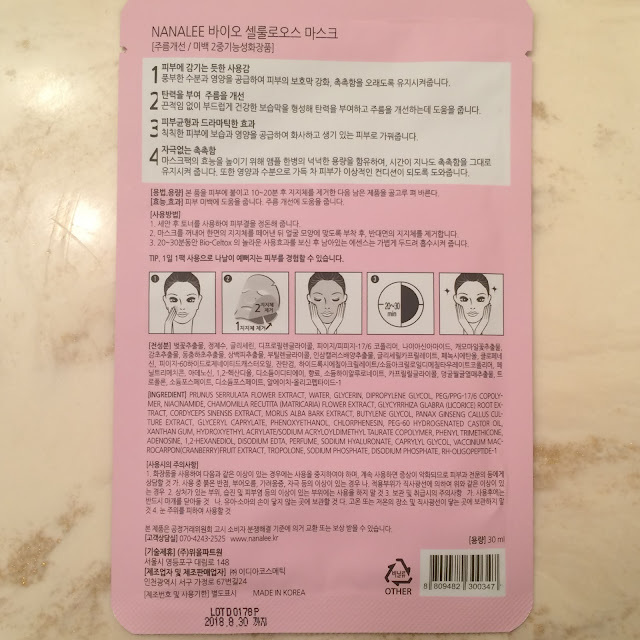 This mask comes in traditional mask packaging - which is a large foil envelope that you tear open. 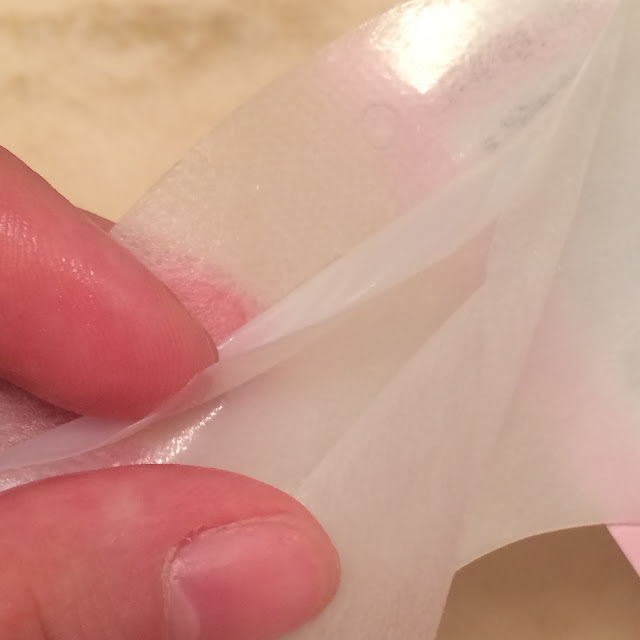 The mask itself is sandwiched between two layers of pearl paper to prevent it from bunching up in the package. I notice a fairly non-descript floraly fresh scent from this mask. It's not overbearing for my sensitive nose, but it does fade after application and I only detect slight whiffs here and there while wearing it. As long as you're careful while applying this mask it lays down on your skin nicely and I personally get a great fit and excellent coverage from this mask. While there's no extra essence in the mask packaging the biocellulose material holds a lot of moisture and stays damp for about 45 minutes before it starts to feel a bit tight a dry. Aside from the cooling and comfortable feeling this mask has against my skin, I love how bright my skin looks and how firm it feels after I use it. Albiet subtle, the scent is not my favorite, but it's something I can easily live with. The only complaint I can see some people having otherwise would be that the cooling sensation almost has a mild tingle to it when I first apply the mask, and that may be bothersome to those with extra sensitive skin. I received this mask complimentary from Mochi Beaute to try out, but it is available for purchase there for $9 each or $45 for a box of seven. Obviously the box is a better deal, and if you sign up for Mochi Beaute's newsletter or watch their Instagram and Facebook pages you can find coupons to save even more! If I had the extra cash, absolutely! 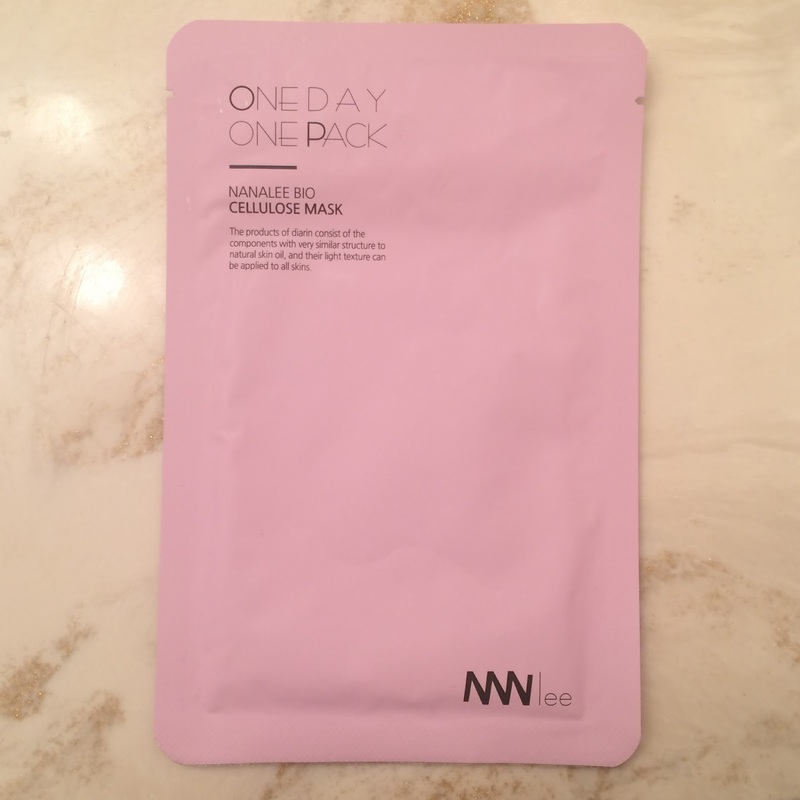 This mask has great ingredients that work well with my skin. It fits great, it feels cool and refreshing, and I do feel that my skin look and feels better afterwards. Make sure to check out my Discounts, Promotions & Affiliates page for discounts!